Tucked away in the corporate international style Citigroup Center in midtown Manhattan lies a spiritual sanctuary designed by one of the 20th century’s great artists. The Chapel of the Good Shepherd, also known as the Nevelson Chapel, is the work of Louise Nevelson, a flamboyant New York City sculptor who rose to prominence for her postwar abstract assemblages that turned street detritus into enigmatic works of art. An interdisciplinary team is restoring the space, both conserving the painted relief sculptures that line the walls and installing modern mechanical systems to better condition the room. 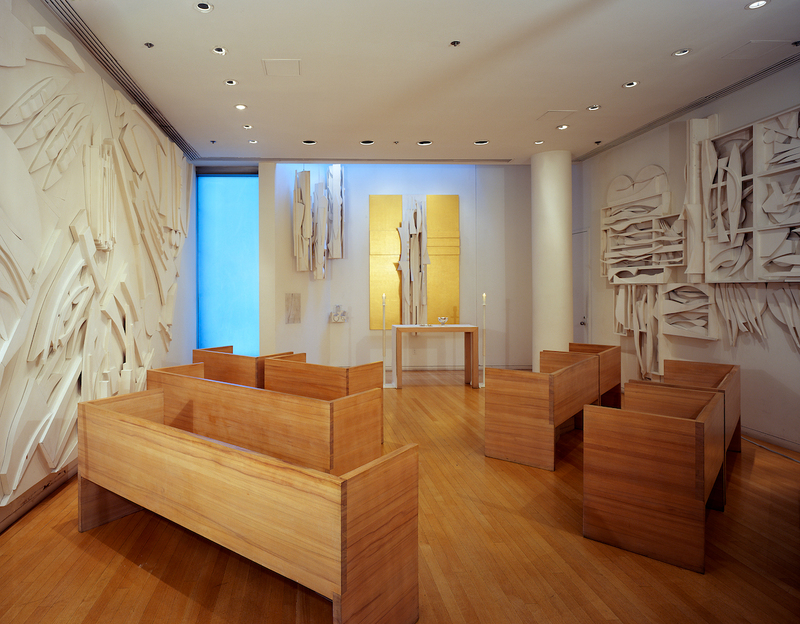 The Nevelson Chapel is a privately owned public space (POPS) in the Citigroup Center, which opened in 1977 and features a distinctive raised base and a slanted roof. The building was landmarked in 2017. POPS began in 1961 when New York City started offering developers FAR bonuses on developments if they would build public spaces as part of the projects. Dozens of these areas are now scattered through the city. As a POPS, the chapel is open to visitors. Saint Peter’s Church originally commissioned the chapel and currently operates the space as part of their worship areas in the complex. The restoration is part of a $5.7 million initiative made possible by donations from nonprofits and individuals, many of whom are connected to Saint Peter’s. Objects Conservation Studio and Pratt Institute students are treating painted wood surfaces to reveal Nevelson’s original paint using a technique developed in Florence, Italy. Jane Greenwood of Kostow Greenwood Architects, Michael Ambrosino of ADS Engineers, Michael Henry of Watson & Henry Associates, Ryoko Nakamura of Loop Lighting, and Sarah Sutton of Sustainable Museums are installing new lighting and mechanical services. According to the Saint Peter’s website, the Nevelson Chapel is accessible every day at almost any hour. The chapel will be open while the artwork is being restored through October 15, after which time more intense construction will take place, and the chapel will close. The space is scheduled to reopen in spring 2019.